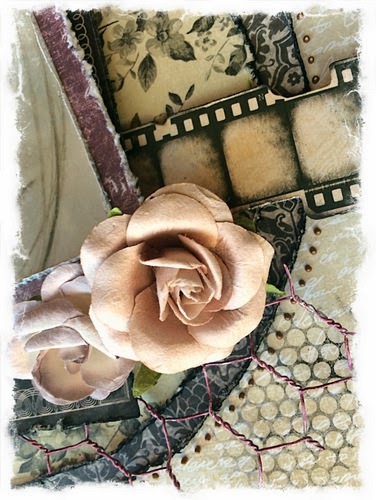 Scrapping Fancy: Welcome to Swirlydoos' February Kit Reveal Blog Hop Block Party!! 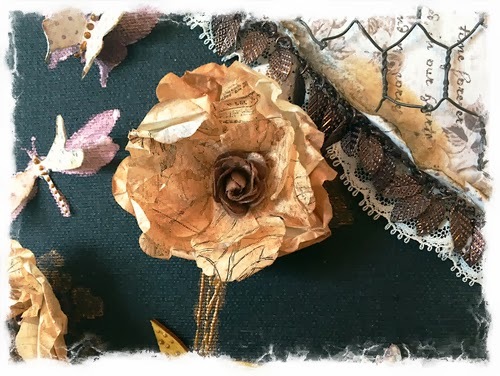 Welcome to Swirlydoos' February Kit Reveal Blog Hop Block Party!! If you came here from Ulrika's blog, then you are on the right track. If not, go back to Swirlydoos' blog and start from there. We have some amazing projects for you to see today !! Make sure to leave a comment on all of the blogs for a chance to win!!! Check out Swirlydoos on Facebook and Like Us!!! Are you a subscriber? If so, your kit is on it's way or you already have it!!!! If not, check out the Swirlydoos Boutique to see if there are any February kits or add ons in the store! I LOVE this kit. I love them all, but I was so ready to play with these colors and fabulous papers, and perfect embellishments! I still have a few more projects I want to do too, but for now, this is what I came up with. I cut off the sprockets of the die cut paper and stuffed them in between my top and middle large layer. I used that same die cut paper to cut out a circle. I added a smaller circle, added some more layers to mat the pic, and stuck part of a film strip sticker in between. The chicken wire was colored with the precious metal paint from the mediums add on. The flowers are from the flower add on. 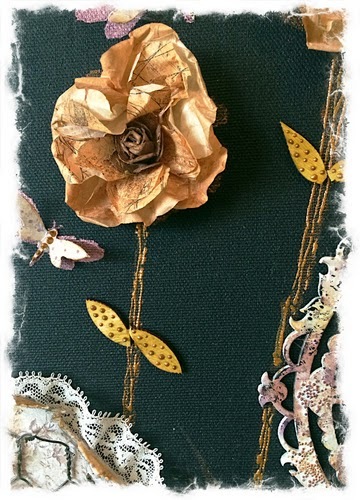 I also use the Tim Holtz stencil from the embellishment add on. I finished off the layout with the copper Liquid Pearls around the circle. 1: Visit all of the blogs and leave a comment on each. This way we know you were there. Take your time. There are REALLY beautiful things to see along the way. The party continues over at the Maja Design Blog. Have fun! I can't believe I am no. 1 to comment on how fabulous your creations are! Totally awesome. Love what you did with this month's sketch. Gorgeous creations from this awesome kit, Rae! Gorgeous creations. Love the canvas. words are so hard to come up with to describe your ideas. Let's see...awesome, amazing, beautiful! Gorgeous projects! Loving the way you have all the teturex going on! DANG!!!!! You did it again girl! Beautiful projects with this months kit. And OMG... I just LOVE your canvas!!!!! my fingers itch to get started. Beautiful projects with the kit. 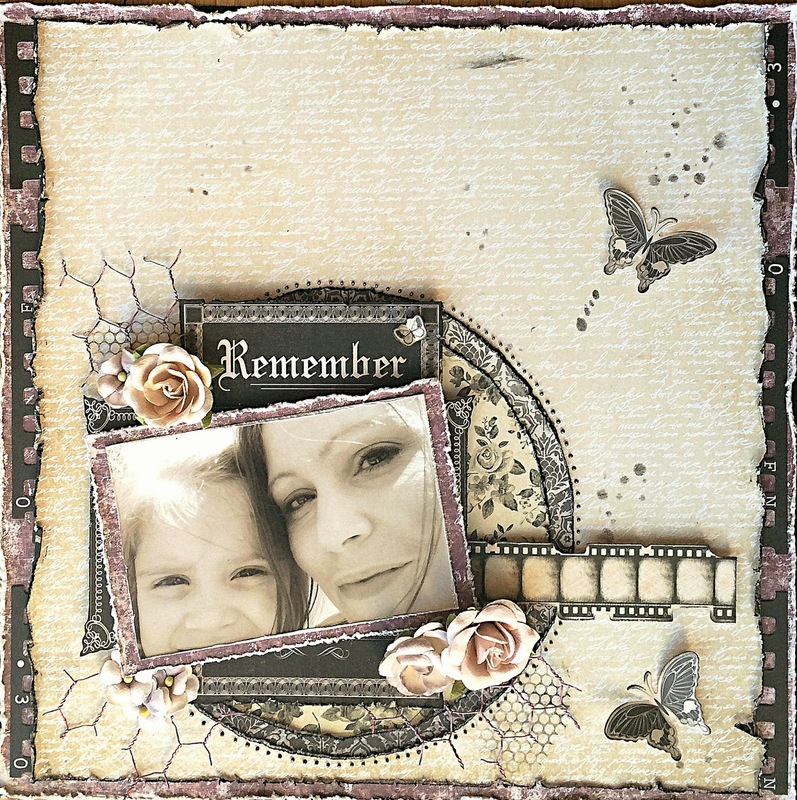 My favourite is your layout, that picture is darling and love all the layering. Just so pretty. Love your work. Love the canvas and can't wait to watch the video. I really like how you colored the wire on your l/o and those copper pearls look awesome! Beautiful projects! Really awesome! So inspired by you! Hugs! I love this layout. It is clean and simple - the picture really stands out. thanks for sharing. 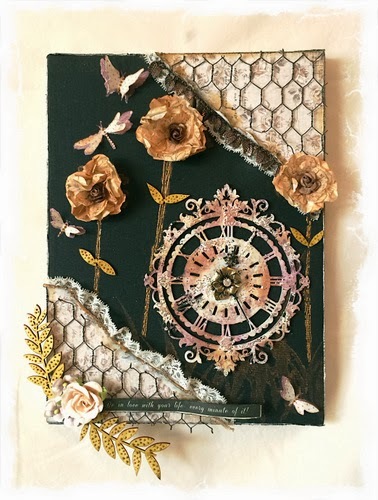 Such stunning work - love the subtle neutrals of the first layout, and then the black canvas is a knockout - amazing finish on the clock - so beautiful. Will be back to watch the video for sure. Thank you for the inspiration. Really love what you did with this kit. Lovely projects. Rea, beautiful take on this month's sketch!!!!! Amazing! I have been hoarding that same clock chippie forever-I love your treatment! The project with the clock and black canvas is wonderful!!! Stunning black canvas project... So elegant yet bold! Never even THOUGHT Of painting the chicken wire!!! That's why we have you to inspire us dear! Beautiful work...just gorgeous!! Incredible layout and canvas...It's interesting how you incorporated the wire into both, yet it has a completely different result! I love the gold on the black background, too. So beautiful! what a beautiful projects, you're so amazing, love your work! Rae That project is crazy good. and I love how you colored the chicken wire in your layout. Once again - Great job!!! Wow! I LOVE your canvas project! Beautiful! 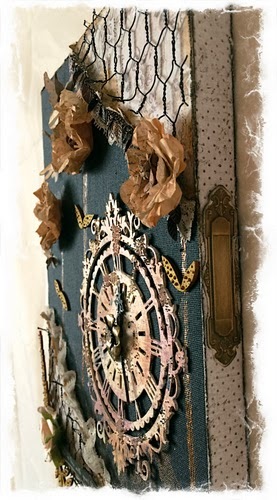 Love what you did with the clock - everything was so lovely. BEAUTIFUL projects Rae. Your clock chippy is just STUNNING! Loved the tutorial. Rae, that black canvas is to die for. I'm so glad I got the kit so I can make one. Thanks! Beautiful layout and loved your canvas!! That clock was through the roof!! Loved the coloring on it!! Hi Rae..Love your back canvas creation...just beautiful. Beautiful canvas and layout. You are so talented. I am loving this kit. 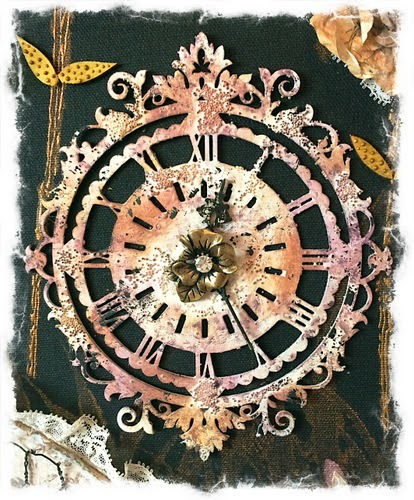 Great layout and canvas Rae, I love how your clock turned out - great video too! Wow Rae! You really rocked this kit. Your canvas is gorgeous! I can't wait to come back here and watch your video again! Really like your layout - especially the sketch challenge one. Love the kit and your projects! What a nice project you have done. Like the clock very much. WOW, That is just amazing, I love the detail on the wall hanging. So much time and creativity in such a beautiful project, thank you for sharing. Love your layout and also the black canvas project - both are so beautiful. Thank you for the tutorial on the black canvas project. OMG! Love both of your gorgeous creations!!! The first one is breathtakingly stunning and the canvas is so lovely!! I love the depth! TFS! I love your layouts and tutorials!!! What a lovely project you've made. Layout is fabulous - love the chicken wire. But the black canvas is to die for. Coming back to watch the video. So much beautiful texture in your layout! 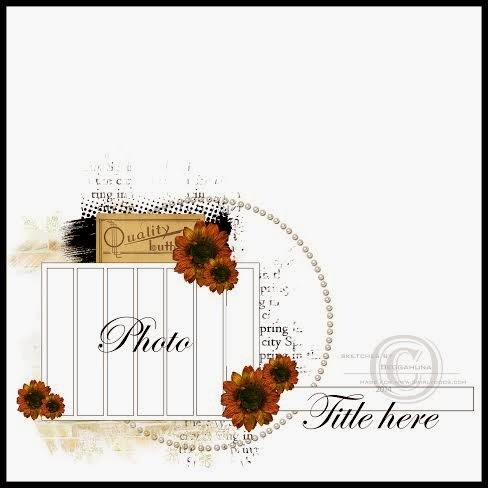 Love the film strip and the layering! OMG your canvas is SUPER pretty and how creative! Loved your amazing video.....watched it all the way!! Everything about your layout is so wonderful. I love the chipboard elements and all the color! Gorgeous layout and canvas. Well done. Gorgeous layout! I love the muted colors and butterflies, thanks for sharing. Your projects are very nice, and that kit is great . Thanks for the inspiration. wow...your projects are amazing...love your take on the sketch! I love our black canvas project. Thank you for sharing!